Join the discussion on our forums! Come discuss Spirit of the Dragonhawk over in our dedicated Spirit of the Dragonhawk discussion topic. Stealth for 1 turn. Your Hero Power also targets adjacent minions. Dragonhawks aren’t known for their accuracy. 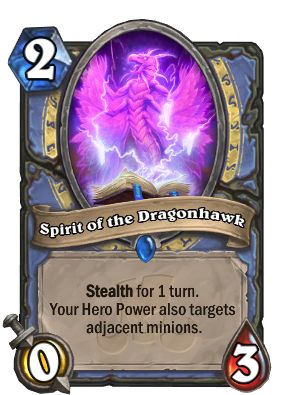 Very nice card if the new Ping Mage archetype can work without needing to be an odd deck. Absolutely love that. Many times it was a struggle to remove all those aggressive minions before turn 6 or 7. Now it might be possible. Still, I am afraid that even that deck we saw yesterday on stream was fun to watch and fun to play - will it be enough? so far this is the most powerful spirit imo. The fact that you can turn your hero power into an insanely potent boardclear (possible over multiple turns) is awesome. and it's not like it has much competition atm. Throw in an Ice Walker and Boom! Your hero power is Cone of Cold. This tells me that I should start watching reveal streams at some point. It's because you don't target the other 2 minions. Does it synergies with DK Jaina? In the reveal stream they managed to pull pinging and killing adjacent minions with Frost Lich Jaina up, summoning 2 Water Elementals, so yep! Play this on turn 2 with Daring Fire-Eater+ hero power turn 3 and rage face on aggro decks and wide boards. Only drawback is the stealth means they should know better than to play into it, but getting an aggro deck to hesitate their board development might still be worth it.